This room was our favorite diy home design project as we researched various staircase ideas. We wanted something that would complement the wood flooring and found a modern wood stair railing that was dark, solid, and drew out the flooring’s colors perfectly. Once we had ripped out the old railing and put in the new railing, we then worked on making the atmosphere of the room something warm yet modern. We selected some modern furniture and a rug that complemented the carpeting on the staircase. The corner table, pictures, and accent table pull the room together while the lighter coloring of the carpeting, furniture, walls, ceiling, and pictures balance out the darkness of the wood pieces. When we decided to add this gorgeous curved staircase to our front entry way, I knew that I wanted to give it a contemporary design but I was not sure the type of railing that would blend well with the overall style of the house. Rather than hiring an interior decorator, I took on our home remodel myself. I have always been told that I have great style and an eye for design, but taking on this project was more than I realized. I actually relied on this site as my source of stair railing ideas since I did not know where to begin. I had debated between an all metal railing and banister versus a classic wood design that may appeal to more buyers later (in case we sell) and ended up settling on this hybrid design. Going through the home building process for the first time, I have learned a ton about a variety of materials I had never even considered before. One of the biggest and most challenging design decisions that we made was actually our indoor stair railings. I never realized before that railings are quite the art form and really do make a huge impact on your interior design. You have to consider so many things when selecting the right style from material and color to what will go best with the architectural motif you have chosen and the scale of your entry foyer. We had already selected this beautiful curving contemporary staircase design based on the fact that it would make an eye catching statement when you walk in the front door. 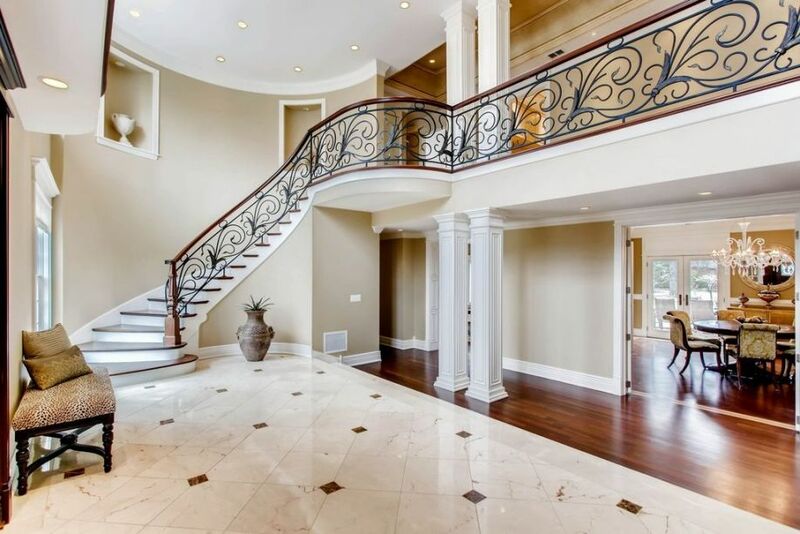 I absolutely love this gorgeous curving staircase design because it adds so much glamour and class to the large foyer. To me a spiral staircase brings such a classic feel to any space that they are in and remind me of the stunning antebellum plantation homes scattered throughout the Carolinas. I know that you need quite a bit of space in order to accommodate a grand architectural feature like this, so it is definitely not a something we could put in our current home -- but I can dream right! The piece that makes this particular design stand out to me the most, is the lovely polished cherry wooden handrail and balcony. The contrast sets off the design and and makes it unforgettably glamorous. 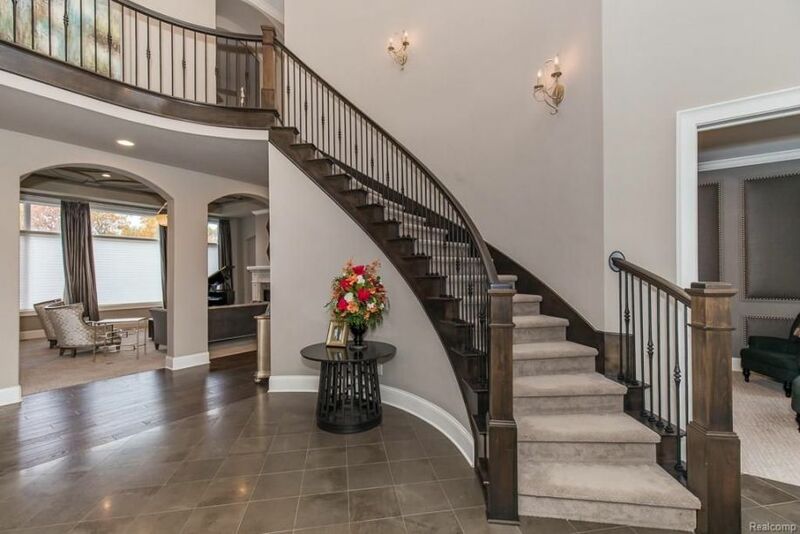 This gorgeous spiced walnut staircase brings elegance to the spacious foyer. 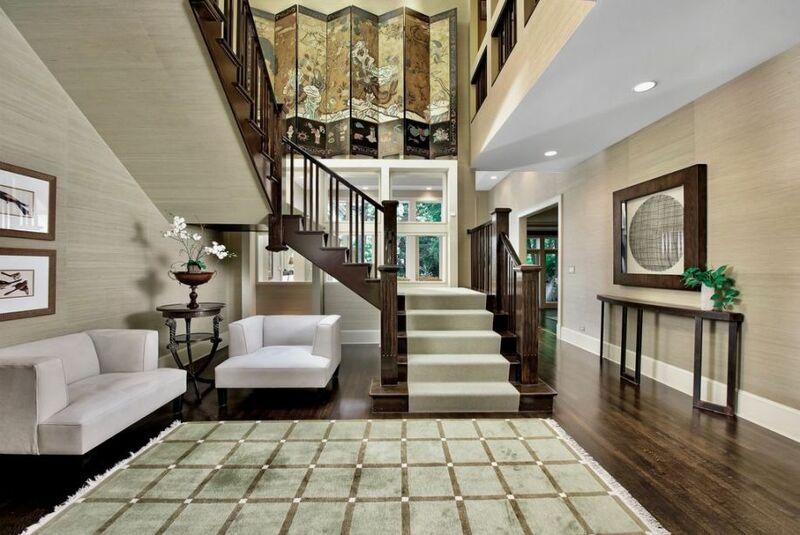 The rich wood, and the sleek stair handrail, adds character to the grand entrance of the home. The pot lights and unique chandelier brightens up the room to showcase the stunning stair balusters and all of its intricate details. We wanted the entryway of the home to introduce our clients home sense and exceed their desire for a mixed flare of modern and contemporary designs. Having white base upon each step brings the room to a beautiful completion. 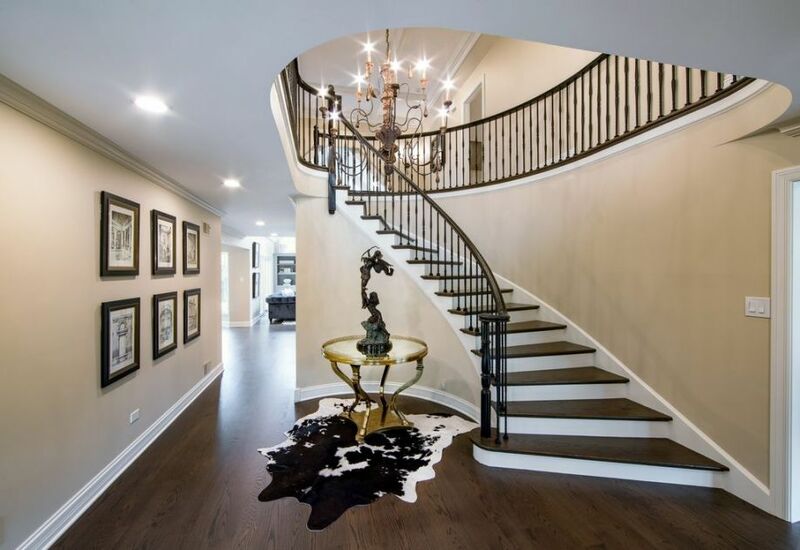 Utilizing the space for the stellar staircase designs making it the focal point, while finishing the look with eye-catching artwork on the accent wall, gold table as a statement piece, an exquisite sculpture, and black and white fur rug to establish a particular sophistication. 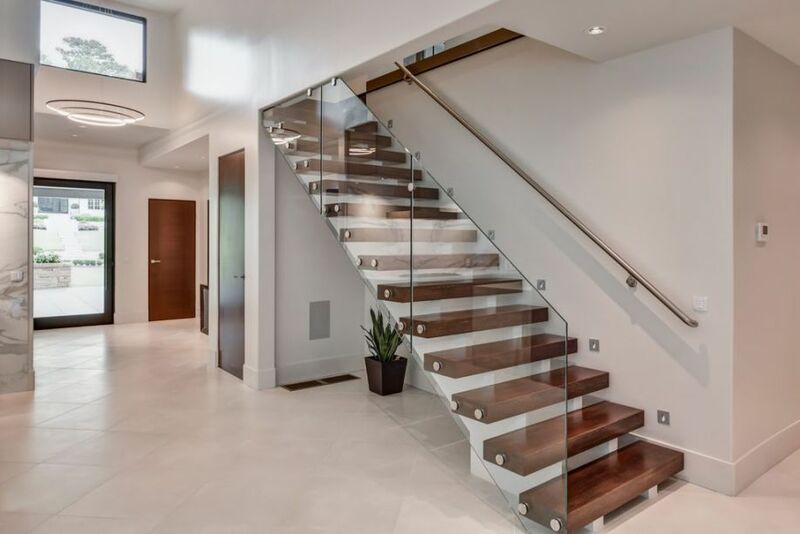 We have built some gorgeous hardwood stairs in the many years that our company has been in business, but I think that this stunning contemporary design may be my absolute favorite of all. The blend of traditional stained wood, with a floating glass railing and edgy chrome bolted accents is such a cool look and one that I have not seen replicated anywhere else. Most modern staircase designs that I have seen feature either a sweeping curved structure our a bold geometric shape often set in the center of a large entryway. In order to accommodate this home's layout, we knew that we would need to tuck the staircase away at the side of the house, but we did not want that to hinder the style.